Some pictures from the 2014 St Patrick’s Day Festival, at D-Cube Plaza in Sindorim. 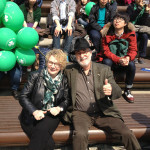 A bit thank you to the Irish Association of Korea for organizing a fantastic event again this year! Thanks also to Chairman Daesung & D-Cube Plaza! Just another Irish music fan! Great photos, good to see the National Holiday being celebrated in far flung places.